The Dame van Amstel was restored by Rederij Belle in 2004 to offer luxury cruises through the canals of Amsterdam, on the Vecht River, the Amstel River and the surrounding waters. The ship has a classic look, with all the stylish details of the 1920s era. While the look is classic, the Dame van Amstel is fully-equipped to provide a contemporary, luxury cruise with excellent catering. This makes the vessel especially suitable for seminars, presentations and business meetings. Furthermore, the Dame van Amstel is the largest saloon boat in the Netherlands, making it the perfect ship for onboard weddings. weather, you can stay dry and warm in the Dame van Amstel’s centrally-heated cabin. No matter the day, Dame van Amstel is prepared to offer a perfect sail. Our Dame van Amstel will show you Amsterdam via the canals or via the Amstel and Vecht: two magnificent rivers with their own character. On the Vecht you sail past 17th century country mansions and small castles, often surrounded by luxurious gardens with lush hydrangeas. You will pass tea pavilions, quaint bridges and some of the most-charming Dutch villages you could imagine. The Amstel River flows between Amsterdam and Uithoorn. While still in Amsterdam, a cruise on the Amstel highlights treasures of the city such as the Magere Brug (the Skinny Bridge) and the Theater Carré. Further along the Amstel you will pass the picturesque villages of Ouderkerk aan de Amstel and Nes aan de Amstel. There are several scenic routes to sail with Dame van Amstel, including the canals of Amsterdam, Breukelen –Loosdrecht, Breukelen – Oud-Zuilen, Muiden – Vreeland and Uithoorn – Amsterdam. Just look where the routes on the Vecht and the routes on the Amstel can bring you. The saloon boat Dame van Amstel can carry up to 80 people. If you include a seated dinner with multiple tables or a sumptuous buffet, the maximum capacity is 56 people. If you wish to sit at one, long table with your guests, the maximum is 42. The timing of your Dame van Amstel cruise can be adjusted according to your wishes. You can enjoy an afternoon trip with a High Tea or an evening dinner on board or a sail to a restaurant of your choice in Amsterdam, on the Vecht or Amstel Rivers. Prices include reservationcosts, booking fees, local taxes and embarkation in the center of Amsterdam ( canal district). Prices are excluding VAT, hostess costs and the catering you wish on board. 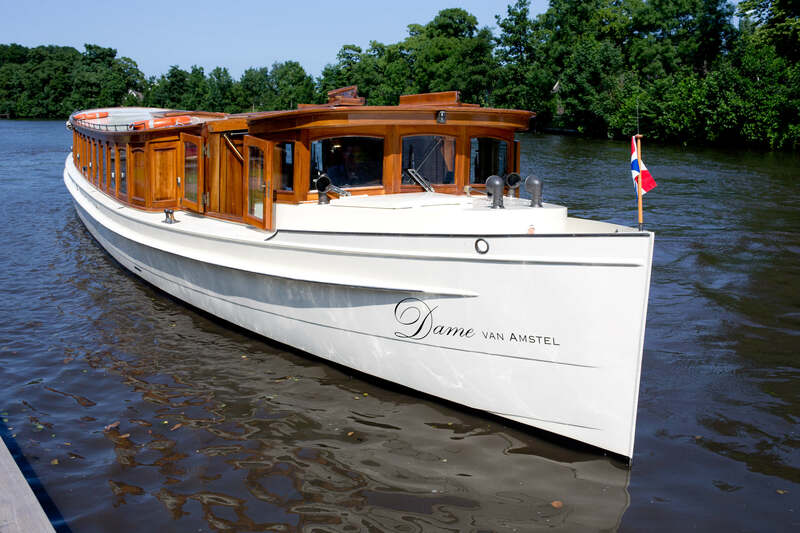 The Dame van Amstel has several possible boarding locations in Amsterdam, on the Vecht River, the Amstel, and the surrounding waters of Amsterdam. Where exactly you come aboard can be determined in advance with the help of your Rederij Belle agent. You may disembark at locations different than where you boarded. This allows you to enjoy a larger sailing area. In this case, you should arrange on shore transportation back to your boarding location. Of course, Rederij Belle is happy to arrange this on your behalf. The Vecht River is known for its romance, as is evidenced by the many stunning wedding venues on the banks of the river. In many of the cities through which the Vecht runs, you can be married onboard a Rederij Belle private boat by a registered official. Would you like a personalised quote for a private cruise on saloon boat Dame van Amstel? Call us at +31 294261433 (during office hours) or send us an inquiry via our contact form. We will respond as soon as possible to discuss your many options.